Have some fun in the sun with this large 20" beach ball! 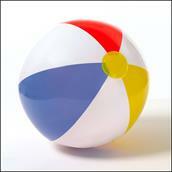 This beach ball features large panels of white, blue, red and yellow circling the ball. It's great for the pool, beach, backyard, or anywhere you may go to cool off on those hot summer days! Ages 3 and up. It's great for the pool, beach, backyard, or anywhere you may go to cool off on those hot summer days! Have some fun in the sun with this large 20" beach ball!